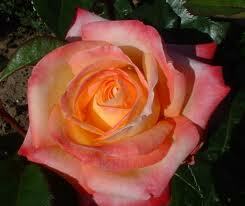 The most widely planted hybrid tea rose in the world. Favored as much for its radiant, sweet-scented flowers as for its story, this rose was named the day Berlin fell to the Allies. On the day peace was signed with Japan, it won All-America Rose Selections honors, and members of the newly formed United Nations were presented with its blooms. 4' high with golden yellow with pink edging, ovoid buds. 5"-6" blooms with 40-50 petals. 18"-24" stems. Glossy, dark green foliage. Sweet fragrance. This beauty is also available in tree form, on a 3' stem, bringing color to a whole new level in your garden!